God's Own Country, Kerala is a paradise of gastronomy. The cuisines of the state are mouthwatering delights. Known as the "Land of Spices", food of Kerala is spicy, hot and aromatic. Food depends on geographical factors. Kerala is snuggled by Western Ghats and Arabian Sea. The region enjoys fares of the sea, poultry, meat, vegetables, rice, coconut, curry leaves, tamarind and spices. Some of the tastiest gourmet dishes are prepared in the coastal state. Ayurvedic herbs are also used to provide nutrition to the delectable food. 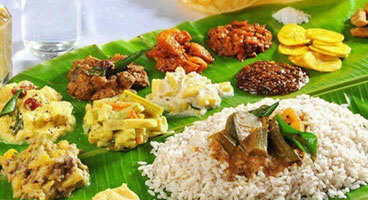 The culinary delights of Kerala aim to tantalize your senses. Kerala is a multi-ethnic state. The varied platters of cuisine are a mix of the various ethnicities. The population comprise traditional Hindu Keralites, Christians, Jews, Muslims and tribals. All these communities have co-existed for centuries. The cuisine of the state has adopted this unique multi-ethnicity. Sadya means feast. The totally extravagant affair, is not a single dish but many vegetable dishes served along with rice on the plantain leaf. The meal starts with a small yellow banana. Other dishes served are banana chips, papads, lime curry, mango pickle, curry, lime pickle, dry mix of any vegetable with coconut, vegetable stew, raw mango and curd mixture, rice, curry of pulses, a lentil based gravy and finally desert comprises of a variety of Payasams. Rasam is a tangy side dish, an integral part of Keralan cuisine. It is basically a mixture of chilly and pepper corns powders boiled in diluted tamarind juice. This dish goes with rice or can be taken as soup. Tomatoes can be substituted with tamarind. Quite basic in preparation, its essential flavors complete a south India meal. The ingredients are nutritious as well as quite a delight for your taste buds both sickness and health. Idiyappam also known as string hoppers is a culinary specialty in Kerala. It is made of rice flour or wheat flour, salt and water. It is generally served as the main course at breakfast or dinner together with a curry (potato, egg, fish or meat curry) and coconut chutney. In Malabar region of Kerala it is also served with sweetened coconut milk. Kerala does not have any indigenous cold desserts, but hot/warm desserts are popular. The most popular example is undoubtedly the Payasam. It is a preparation of milk, coconut extract, sugar, cashews, dry grapes, etc. Payasam can be made with many constituents – rice, jaggery, milk, rice powder, dal, banana, wheat and vermicelli. Jaggery or molasses is the sweetening ingredient. Other popular sweets include plantain pancakes, rice dumplings and halva is also popular in Kerala. Popularly known as Malabar biryani or Thalassery biryani, this is the only biriyani variant of Kerala It is a famous dish all over Kerala for its exquisite taste and aroma. The speciality of this biriyani when compared to the other biryani variants is the choice of rice (Khaima rice and not Basmati) and the method of preparation. Biryani is prepared with hard boiled eggs, pieces of chicken, lamb meat, beef. With the succulent dish; swirls of fried onion and raisins, date chutney, a raita and puffed golden papdums can be savored. Kerala cooking has enhanced the taste of non-veg curries. They include fishes, crabs, prawns, lobsters, mussels and shrimps. Made with coconut milk or tamarind, its a mouthwatering delicacy. Onions, tomatoes, grated coconut, tamarind, red chilies and the hot spice combine a unique taste. The most popular ones are chicken curry (Nadan Kozhi Curry), fish curry (Meen Curry), prawn fry (Konchu Varuthathu), Spicy Steamed Fish (Meen Pollichathu) etc. Kerala being a coastal area is hot and humid. A variety of drinks have come up to cope with the temperatures. Herbal teas, Ayurvedic teas both warm or at room temperature are used. Sambharam, a diluted buttermilk flavoured with ginger, lime leaves, green chili peppers etc. is a soothing drink. Coffee and tea (both hot) drunk black, or with milk and sweeteners. Fresh lime juice, milk shakes, other fruit juices and tender coconut water are popular beverages. Appam is the soft pancake made from toddy fermented rice batter, with a soft spongy middle, laced with crispy edges. Consumed with either vegetable or chicken or mutton stew, it is thoroughly mellowed with thick coconut milk and garnished with curry leaves. Pickles and snacks of Kerala are Crunchy padaps, pickles, chutneys, banana chips, jackfruit chips, pakka vada (crunchy gram and rice flour chips), etc.